We took inventory of the destinations we’ve flown our clients, and these golf courses came up on our flight plans repeatedly. La Quinta: There are over 130 courses in the valley, making this one of the most popular areas for golf in the country. With courses like PGA West (Palmer, Nicklaus, Norman and Stadium courses), The Quarry, Tradition, Silver Rock, Bermuda Dunes, The Classic Club, La Quinta Resort, Hideaway, the Madison Club, Bighorn, how can you go wrong? The Jacqueline Cochran Regional Airport in Thermal and the Bermuda Dunes Airport serve this incredible collection of golf courses in California’s desert resorts region. Pebble Beach: The home of the 2010 U.S. Open, and probably the most photographed golf course in the world, Pebble Beach is on every golfer’s bucket list. 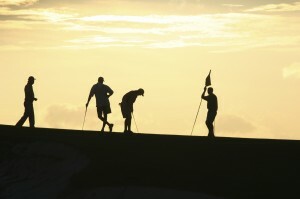 Nearby popular courses include Spyglass and Spanish Bay. Bring plenty of golf balls and a sweater. Pebble Beach, Spyglass and Spanish Bay are all served by the Monterey Peninsula Airport in Northern California. Bandon Dunes: With three golf courses on almost everyone’s top ten list, Bandon Dunes, Pacific Dunes and Bandon Trails are situated right on the picturesque and rugged Oregon coast. The Old MacDonald course opened this year as the fourth and final course on the property. Links style golf with tight lies, beautiful vistas and challenging designs have made this a very popular destination for Desert Jet clients. Bandon Dunes is served by the Southwest Oregon Regional Airport in North Bend, Oregon. Sutton Bay: This special private course has a flavor all its own. A links style course just off the banks of Lake Oahe, near the town of Agar, South Dakota, Sutton Bay is a favorite amongst Desert Jet flyers. Incredible wildlife, a challenging but fair course, you will wish you brought your camera. The par-3 17th is just amazing. By the way, the record is 105 holes played in one day. Sutton Bay is served by Pierre Regional Airport as well as the Gettysburg Airport. Rock Creek: Part of an 80,000 acre working cattle ranch, Rock Creek Cattle Club is a private country club in central Montana that has a beautiful par 71, 6,300 to 7,400 yard Tom Doak course that uses 350 of those acres. It was listed as the best new private course in 2006. The views of the mountains will take your breath away and the golf and accommodations will keep you coming back to this amazing place. You may have to putt around the Elk footprints on the green on occasion. Rock Creek is served by Deer Lodge Airport in Montana. BallyNeal: Designed in the heritage of Scottish and Irish seaside links golf, BallyNeal is as natural a course as you can get. There are no tee markers; you hit from where you hit. There are no carts, either. The elevation changes, layout and beauty of this private course will astound you. Play it straight and you will score well. Poor shots are penalized heavily. BallyNeal is serviced by Holyoke Airport in Colorado. Augusta: The home of the Masters and one of the most exclusive private clubs in the world, Augusta National is the world stage for golf every April. Who would say no to an invitation to play here, just to say you survived Amen Corner! If you are going to “The Tournament”, plan early as we have lots of demand during this period. Augusta National is served by Daniel Field and Augusta Regional Airport in Georgia. Pine Valley: A par 70 course at just over 6,500 yards, it has a slope rating of 153. High scores are the norm here, but the beauty edges out the difficulty. Consistently listed very high in top 10 ratings in most major golf publications, it made the Desert Jet list as well! Pine Valley is served by Philadelphia International and Millville Municipal Airports. Sand Hills: Completed in 1995 by Ben Crenshaw and Bill Coore, This private club in Nebraska is only open for golf from the first of June to the first of October. With a sand base that meets the PGA requirements for greens spread out over the entire course, the grass is incredible. The construction process was simple: great courses are discovered, not created. Minimal intrusion to the natural landscape provides a course that many say is the best they have ever played. Sand Hills is served by North Platte Regional and Ainsworth Municipal Airports. Bay Hill Resort: The site of Arnold Palmer’s Bay Hill Invitational Tournament, this course is very popular, not just for the incredible golf, but the outstanding instruction available from the staff trained by Mr. Palmer himself. Bay Hill is Desert Jet’s most popular course in Florida.